Daugavpils Lokomotivju Remonta Rupnica (Daugavpils LRR) train engine repairs group increased production by 75% last year, the company’s board member Gatis Kamaruts told LETA. “In 2017, the plant’s production volumes grew by 75%. According to preliminary results, significant growth is expected also in the first quarter of this year. Over the past year we have created more than 100 new jobs, but we are still short of workforce. Our estimates suggest that we will need another 100 new employees in the nearest future,” Kamaruts said. At present there are 640 employees working at Daugavpils LRR. Kamaruts informed that demand for the company’s services has been growing for on the 1,435 mm gauge and 1,520 mm gauge railroad markets. For that reason, in addition to expanding to new markets, Daugavpils LRR plans to increase its turnover also in its traditional markets. The company’s representatives also noted that Estonia’s Skinest Rail has become the sole owner of Daugavpils LRR. Skinest Rail board member Romans Zaharovs indicated that the acquisition of all Daugavpils LRR shares was part of the group’s general development strategy. 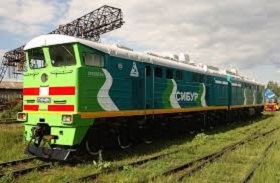 He also informed that in order to further increase the plan’s output, in recent years the management of Skinest Rail and Daugavpils LRR have been shifting the focus of the company’s business operations to western markets. “We have concluded a number of long-term agreements with several European companies, and in addition to that, in the past five years the group has invested over EUR 8 million in new equipment, which has enabled the plant to achieve a new level and successfully compete with analogue European companies,” Zaharovs said. Daugavpils LRR posted a revenue of EUR 16.2 million for the first nine months of 2017, marking an increase of 44.8% over the same period last year. The group's loss contracted 18% year on year to EUR 2 million, according to the unaudited report submitted to Nasdaq Riga.